Mr McFallís Chamber was formed in 1996 as a response to an increasingly narrowing demographic for classical music in Scotland at that time. The original string quartet, which has remained almost the same line-up throughout the groupís history, played to nightclub audiences and offered a mixture of types of music, some popular, some way-out. 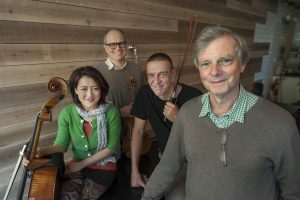 More recently the group, with a more extended line-up than in its earliest days, has tended to take over concert halls instead, while still offering repertoire which spans the divide between classical and non-classical. In the last few years the group has extended and developed its tango repertoire with Argentine bandoneon player, Victor Villena, and French violinist, Cyril Garac. The group has commissioned many new works from a variety of composers over the years, and has collaborated with a number of singer/songwriters. It has also set up many educational projects around Scotland, such as North Ayrshireís ìTango Festî, in which more than three hundred young string pupils performed a programme of traditional tango numbers with the group in December 2012. Since 2009 the group has recorded a number of CDs for Delphian Records. Last November, Delphian released their new recording of Astor Piazzoll'a ìMarÌa de Buenos Airesî, which has been enthusiastically received. Their previous release, ìSolitudesî, which contained a programme of music from the Eastern Baltic seaboard, was the editor of Gramophone magazineís ìCD of the monthî when it came out in 2015. 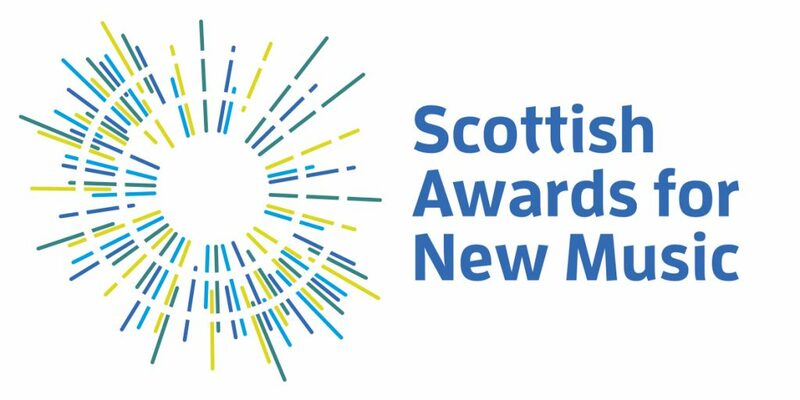 As Scotland’s international contemporary music ensemble Red Note criss-crosses its home country each year, performing to audiences from the Outer Hebrides to the Borders in traditional settings including concert halls, and in bothies, pubs, clubs and aircraft hangars. Internationally, Red Note has performed to great acclaim at festivals and venues across Europe, Australia and the UK. 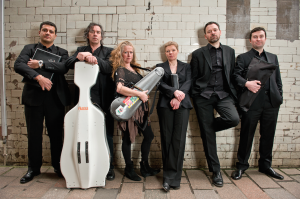 The ensemble records for the Scottish Delphian CD label, and broadcasts regularly on Radio 3. The ensemble also undertakes an extensive programme of Access, Engagement and Participation (AEP) work, focusing particularly upon working with younger and older people, people with multiple disabilities, and people living in areas of high multiple deprivation, as well as working to address inequalities of access and representation due to race/ethnicity and gender imbalances. Alongside this, Red Note undertakes an extensive performer and composer development programme within schools, universities and conservatoires both nationally and internationally, through its annual Red Note Advanced Academy each September. 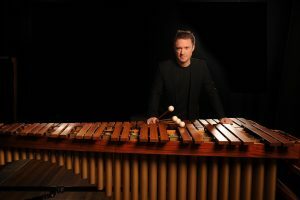 Colin Currie Percussion Artist in Association, Southbank Centre, London Artist in Residence, Oregon Symphony Orchestra Hailed as “the world’s finest and most daring percussionist” (Spectator), Colin Currie is a solo and chamber artist at the peak of his powers. Championing new music at the highest level, Currie is the soloist of choice for many of today’s foremost composers and he performs regularly with the world’s leading orchestras and conductors. A dynamic and adventurous soloist, Currie’s commitment to commissioning and creating new music was recognised in 2015 by the Royal Philharmonic Society who awarded him the Instrumentalist Award. From his earliest years Currie forged a pioneering path in creating new music for percussion, winning the Royal Philharmonic Society Young Artist Award in 2000 and receiving a Borletti-Buitoni Trust Award in 2005. Currie has premiered works by composers such as Steve Reich, Elliott Carter, Louis Andriessen, HK Gruber, James MacMillan, Anna Clyne, Einojuhani Rautavaara, Jennifer Higdon, Kalevi Aho, Rolf Wallin, Kurt Schwertsik, Alexander Goehr, Andrew Norman, Mark-Anthony Turnage, Julia Wolfe and Nico Muhly. Looking ahead, in the coming seasons Currie will premiere new works by Andy Akiho, Helen Grime and Simon Holt. Currie’s 2017/18 season is marked by a number of other premieres including a new work for piano and percussion by Sir Harrison Birtwistle with Nicolas Hodges at the Library of Congress and London’s Southbank Centre. Currie will also premiere new works by Brett Dean and Joe Duddell with Håkan Hardenberger at Malmo Chamber Festival this September and Aldeburgh Music in November 2017, and a new work for percussion and electronics by Dave Maric with the Scottish Ensemble.